Heat oven to 425°F. Line 15x10x1-inch pan with cooking parchment paper. 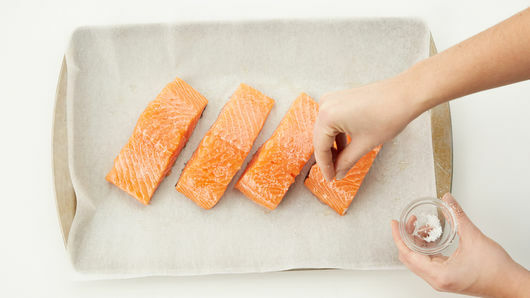 Pat salmon dry with paper towel. Place salmon, skin side down, in center of pan. Brush with 1 tablespoon of the olive oil. Sprinkle with 1/4 teaspoon of the salt. In small bowl, mix 2 tablespoons of the olive oil, the bread crumbs, 1/4 cup of the Parmesan cheese, 1 teaspoon of the lemon peel and the pepper until well mixed. 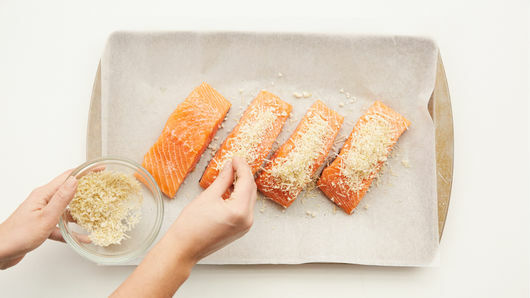 Sprinkle evenly over salmon filets. In 2-quart resealable food-storage plastic bag, shake asparagus, garlic, remaining 1 tablespoon olive oil and remaining 1 teaspoon lemon peel until well coated. Arrange asparagus around salmon filets. 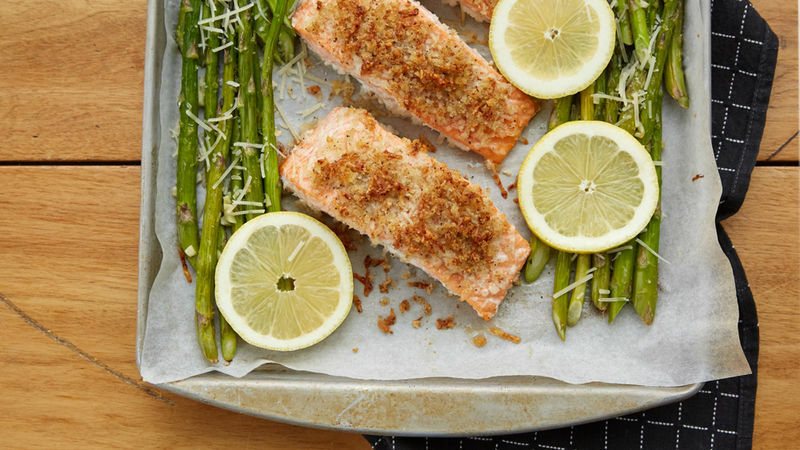 Bake 15 to 18 minutes or until salmon flakes easily with fork and asparagus is tender. 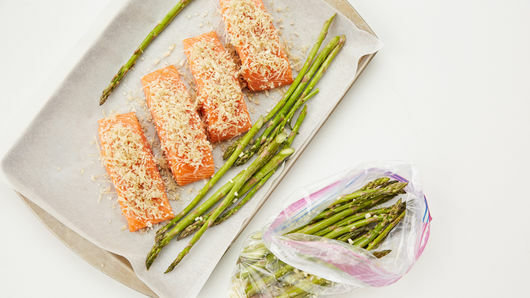 Sprinkle asparagus with remaining 1/4 cup Parmesan cheese. Serve immediately. Serve this delicious salmon and asparagus with warm slices of Pillsbury™ refrigerated crusty French loaf.